➤The steel plate attaches easily to a wall, vertical stud, or secure overhead beam. ➤Durable and weather resistant to be installed indoors or outdoors. ➤Turn any room or any space into a home gym. ➤Perfect for exercises involving suspension trainer bands, straps, rings, etc. ➤Workout anywhere indoors or outdoors with this durable anchor point. Made of rugged steel that attaches easily to walls, studs, or overhead beams. Solid materials, safety is not easy to break. Strengthen the overall structure, more solid and reliable. 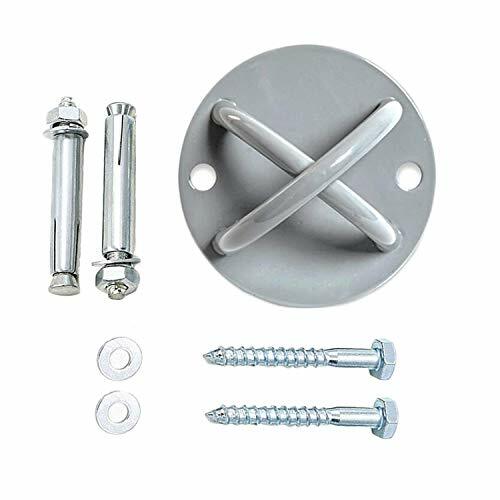 ➤Painted Steel Anchor Diameter: 12cm / 4.7"
➤Painted Steel Anchor Height: 6cm / 2.36"
Our Mount provides you with a permanent wall or ceiling fixture allowing for in home use of a suspension strap training systems, resistance bands, Crossfit Olympic rings, battle ropes, Yoga Swings, or Boxing equipment. To be used at home or in the gym it only takes a couple of minutes to install and it will give you awesome workouts for years to come. Note: We do recommend professional installation to ensure your product will be properly attached to a strong load bearing wall / stud / overhead beam. Amber Fight Gear AFG Deluxe Tricep Rope Pull Down 27"